Aaw... I knew I forgot something here! Tanxx for posting this Anni! And didn't we say it was ALL about his team (RedSox)?!!! Hehehe.. I hope they did win!! Yeah, I was a little confused you had not posted this here. Mike seems to get quite euphoric when it comes to sports. But I don't think he's cheering for the same team Chris does. Well... they're from different city, so... its natural I think that they doesn't like the same team... But on the other hand... look at us we from different cities/ or even countries and ARE into the same Musicians, too. Hehe. But, well... Thats HUMAN I think. And I think as long as they are still makeing music together and don't decide that one of them should leave even before the CD is getting released... It's ALL more than fine to me!!!!! Iam just kidding with that "leaving the band early" .... *grrr* If it comes to this they hopefully know already, that they are GETTING TOUSANDS and MILLIONS of MAILS!!!!!! Haha, I'm sure they're mature enough not to fight over this. Yeah... I think/ hope this as well. As they are all grown up - or at least by law! HA! *Sigh* Isn't he cute "our" Mike!? ...The Sportsfanatic guy!!!!! haha and thanx for this I finally know what it means..
Haha... Yeah, so thankful to Ernie! A lil L-A-O-L-A now for him. Mike Bosch: Shuttle launch lit up my backyard! Very cool! I hope he'll reply to my comment I couldn't resist to left him. Hehe! I asked if he toke a pic!! Mike Bosch: I finally found bialys in Orlando! And they're from Brooklyn! Yep. It's some Polish pastries. Haha... Kay! Thanxx Anni!! You re way too fast for me! LOOL! ... As I said already I am stupid today. Blame it to the lack of sleep (again)!!!!!!! That's not stupid. You can't know everything, Rina. well, yea thats true maybe... but I can not think very good and fast today either... LACK of ! *shrug* Was my own fault... but I doubt I could have sleep anyway even if I'd have tried earlier... blame to the hormones....! Hormones can be stupid lil a-holes sometimes. yeah... thats a TRUE word!!!!!!! Okay... a lil recomment on Mike's last update now... Mike cleared it up: If your local Publix has 'em, they'll be in frozen foods right next to those silly Lender's products. Sarah, picture all of the strongest attributes of english muffins and bagels combining forces! I know right!? 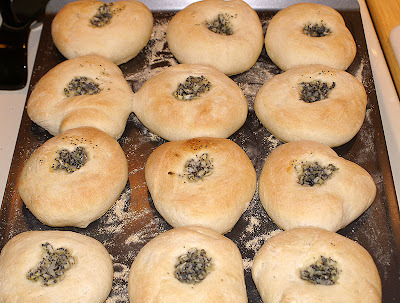 Good bialys have minced garlic in the middle. Mike Bosch: If I decided to pursue the art of the mungo, I'm convinced that the majority of my day would result in floccinaucinihilipilification. However, being an optimist, I would scour for items of significant measure! Look what Mike posted for a lil Cutie!! Sweeet! I love frogs, especially their cute little hands. Aaaw! Hehe.. yep, me as well.. Especially this one looks really cute! How its trying to get out of this pool! ?